Next came our chosen complimentary dish, half bird of Hai Nan Chicken 海南雞. 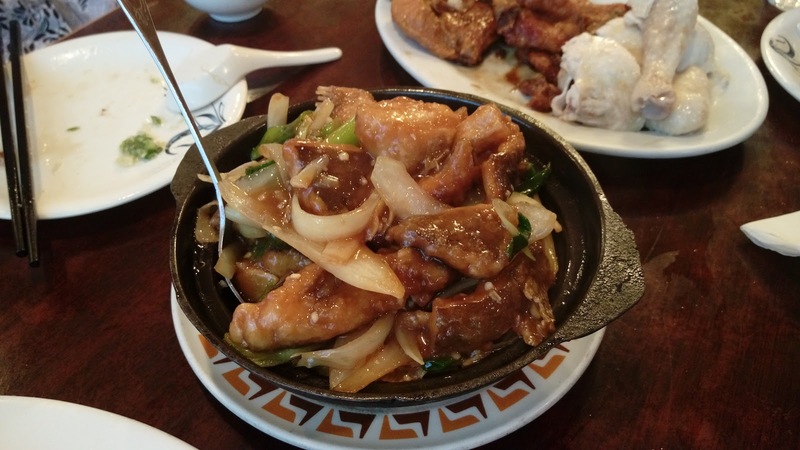 Because the bird was rubbed with kencur and served with only a dip of ginger and scallions, this dish resembled more as a Sand Ginger Chicken 沙薑雞. While not too gelatinous, both the dark and the white meat were delicate and moist. This was one of my favorites. The Pork Chop in Maggi Sauce 美極豬扒 was a meaty dish. 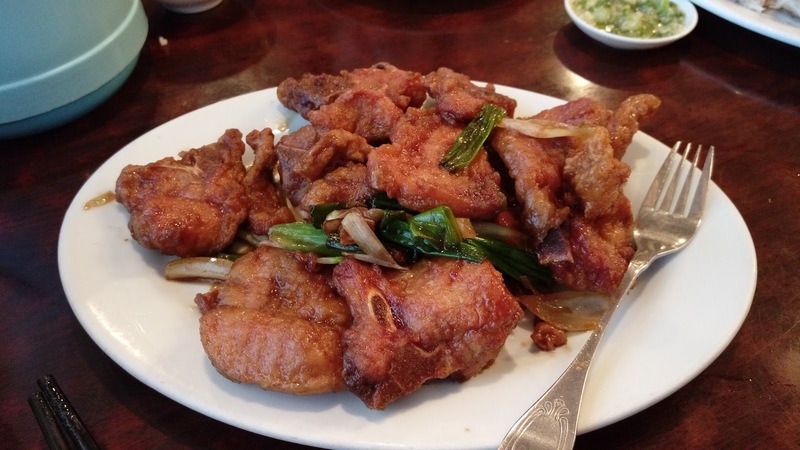 The chops were gently coated, deep fried then tossed quickly in a blend of Maggi seasoning sauce, onions and scallions. Portion was sizeable. 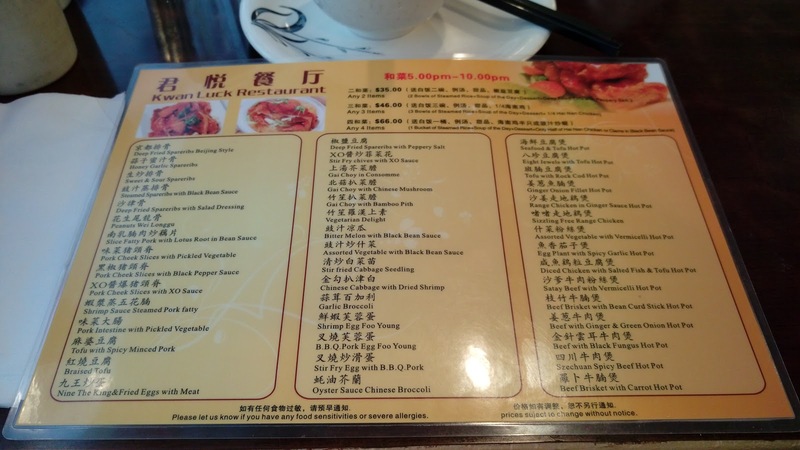 Of course, the first thing Buddha Boy wanted as he browsed through the menu was the Shrimp with Scrambled Egg 滑蛋蝦仁. The eggs were fluffy but not smooth. 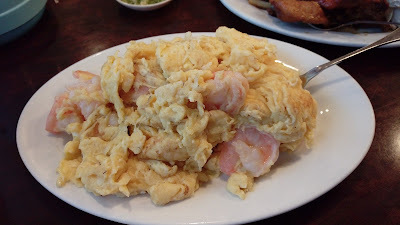 While the plate had sufficient amount of big shrimps, the texture of the shrimps was soft and lacked crisp. MomJ ordered two dishes. One was the Ginger Onion Fillet Hot Pot 薑蔥魚腩煲. The fish used here was giant grouper 龍躉, commonly (and mistakenly) known by many as lingcod. 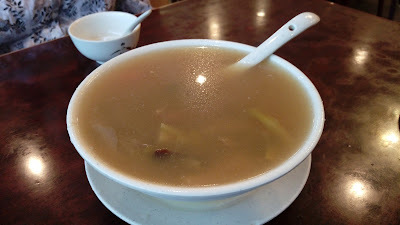 The Chinese menu names states that this was a fish-belly pot, however, the pot had a lot of meaty pieces. 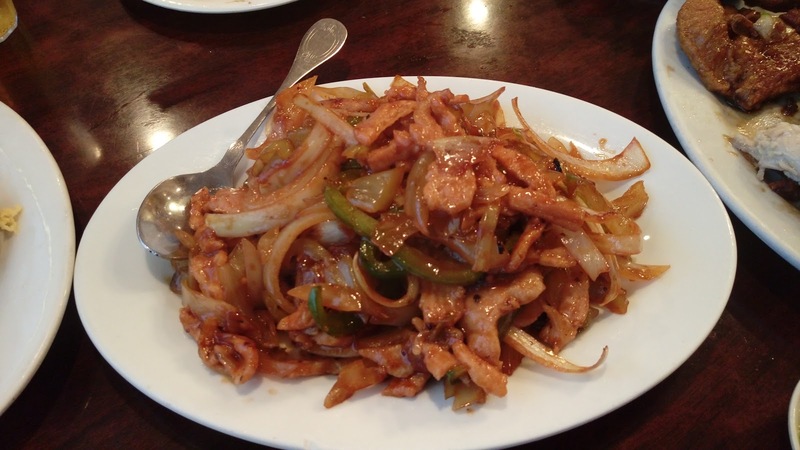 Flavors were simple, using the common detectable blend of soy sauce, sesame oil, Chinese cooking wine, oyster sauce, sugar, ginger, onions and scallions. This was a good bang for the buck. Our least favorite dish was MomJ's order of Pork Cheek Slices with Pickled Vegetable 味菜豬頸脊. Don't get me wrong, the plate had plenty of pork cheek slices, but the sweet pickled vegetable and the overuse of ketchup made the whole package extremely sweet and awfully tangy. Not recommended. 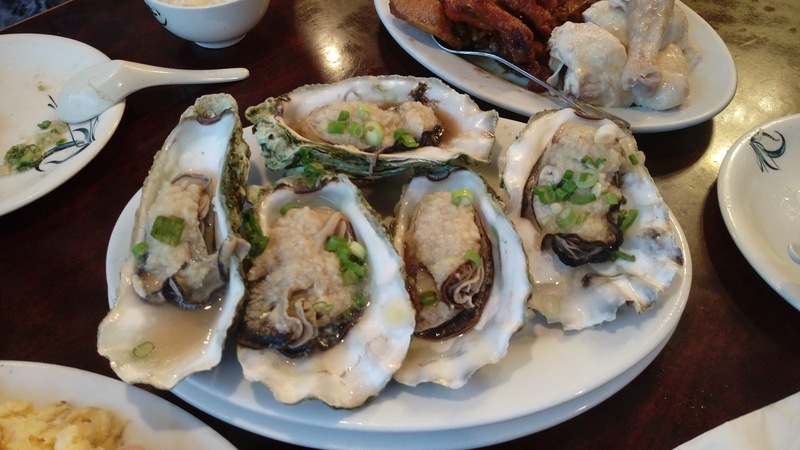 The menu on the wall stated $15.00CAD for four Steamed Fresh Oysters with Garlic 蒜蓉蒸生蠔, but we got five, hey, we're not complaining. These beach oysters were fresh, pudgy and luscious. Nothing beats the proper use of freshly chopped garlic to highlight fresh seafood. This was another one of my favorites for the night. Service was surprisingly friendly and homey. We were seated as soon as we walked in with neighborly greetings. While not frequent, every time any of the two servers came by or walked by our table, we were asked if we needed anything. Our meal ended with a fun game of charade on two sides of the room trying to show the number and the sizes of takeout boxes needed for our leftovers. We enjoyed our visit. 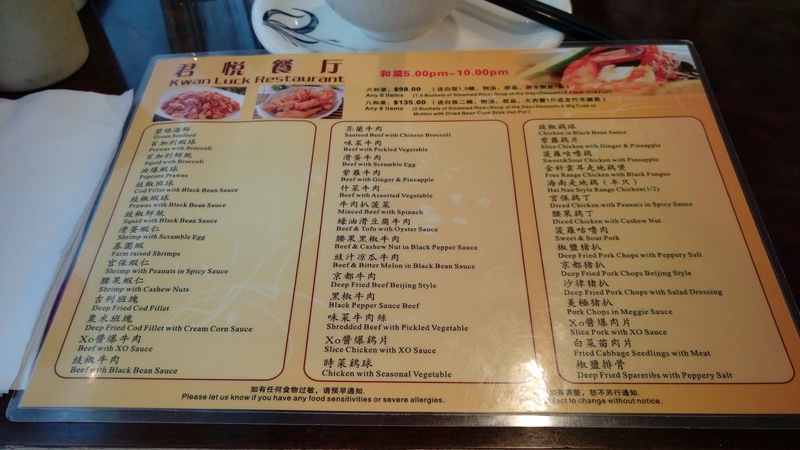 Prices were very reasonable for the vast portions. While there were some misses, overall quality and flavors were satisfying. As for the unexpected welcoming service, hopefully it's not just an odd case.